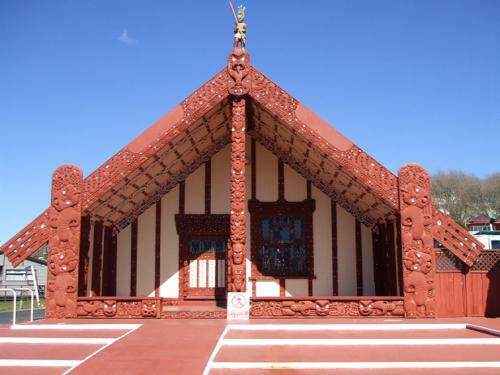 Taking a stroll through Ohinemutu to the Te Papaiouru Marae (village centre), you can't help but get a sense of the richness and depth of māori culture. This marae doesn't have the almost frantic activity associated with the larger commercial operations. In fact, when there are no formal functions taking place, a peaceful, spiritual air fills the place. Not so peaceful are the hissing, bubbling sounds clearly heard on arrival in the village square. Houses occupied by locals are dotted about amongst this activity and seriously, you'll wonder how they can live there. As you can see by the photo, the Tama-te-kapua meeting house is a beautiful building that is still in use by the Te Arawa people today. The name is quite often shortened to 'Tama' by locals. It is named after the captain of the Te Arawa waka (canoe) that sailed to New Zealand from the mythological homeland, Hawaiki. While still in Hawaiki, Tama-te-kapua used stilts to steal fruit from a tree belonging to a chief by the name of Uenuku. 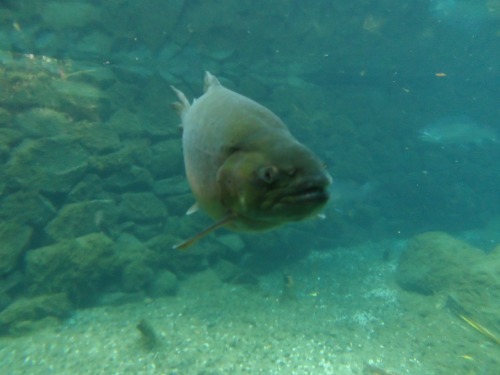 The outcry that followed is what led to Tama-te-kapua leaving Hawaiki and subsequently settling in New Zealand. If you get the opportunity to see inside the meeting house you will see a carving of Tama-te-kapua with his stilts. Stories are told in the carvings (whakairo) with every swirl and cut having a meaning. This keeps our history, culture and identity alive. Next to the meeting house is another large building. That's the Wharemoi where people sleep when visiting the village for a tangi (funeral) or other occasion. At the rear of that building is Ohinemutu Māori Handcrafts which I say more about further down. 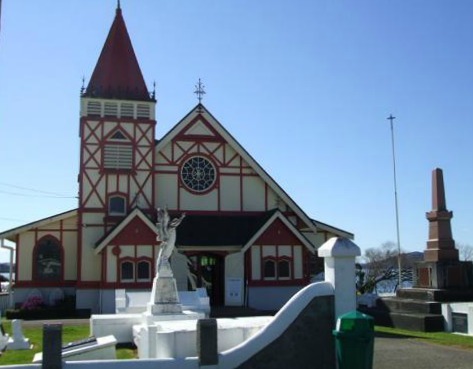 Opposite Tama-Te-Kapua is St Faith's Church. As churches go, it's tiny, but for all that it packs a hefty punch. Once you step inside, your senses are assaulted from all sides. 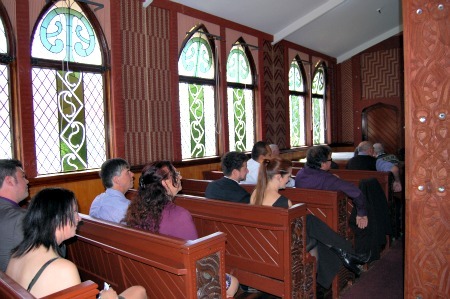 It is intimate and cosy with vibrant Māori carvings (whakairo), wall panels (tukutuku) along with Māori and European decorations of stained glass. 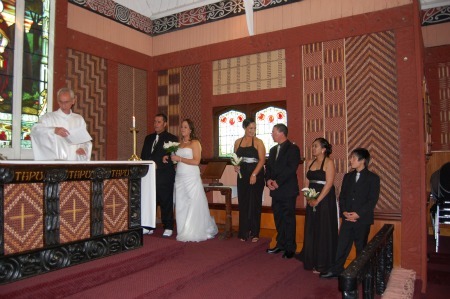 The interior shots below were taken at my son Ricci's wedding in 2012. Vicar Tom Poata presided, you can read a bit more about him below. Click the pic below to start the photo gallery. 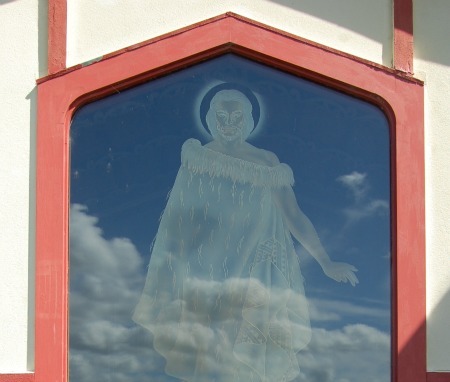 One of the stained glass windows features Christ adorned with a māori cloak (korowai). It's so cool because the lake is behind the church and it looks like he is walking on water. The vicar, Tom Poata, would have to be the most 'irreverent reverend' I know - not that I know many. 'Irreverent reverend' are the words that immediately spring to mind when I think about him. Hope he doesn't mind. He's hilarious and a very quirky character, definitely not what you would expect a vicar to be. The Service of Holy Communion is held there every Sunday at 9am in a mix of both Māori and English if you would like to attend one. At the front of the church is the grave of Gilbert Mair, a champion of the Te Arawa people for many years. At the rear of the church is a cemetery holding graves of soldiers who served in the 28th Māori Battalian and fought in the Second World War. What's noticeable is that the graves are raised which is due to the thermal nature of the area. 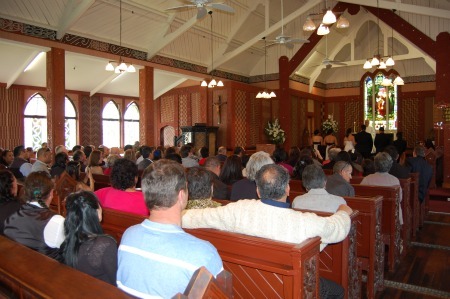 To the side is Te Ao Marama, the church hall. Walking along the narrow road for a ways, various fences can be seen housing family baths that utilise the thermal waters. You might also see people putting food into the hot pools to cook. A short way along this road is the Tunohopu Marae. Master carver Tony Kapua heads up this business handed down from his father Tuhaka Kapua, also a master carver. 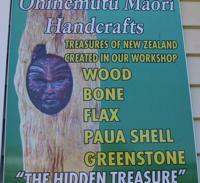 They sell 'treasures' created in their workshop made out of wood, bone, flax, paua shell and greenstone. Just recently, Tony, along with Glen Curtis and Hohepa Pene completed six months work carving eight pou (posts) as centerpieces for the new outpatients building at the Rotorua Hospital. 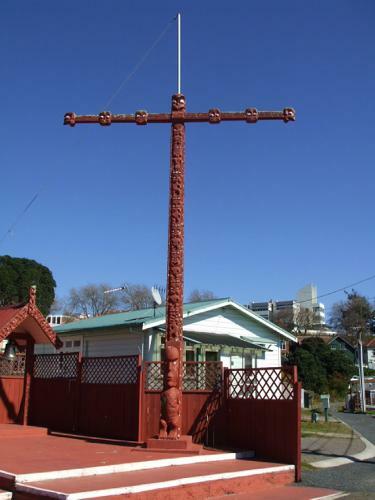 The carvings represent six revered ancestors of the Ngati Whakaue people along with two gods. 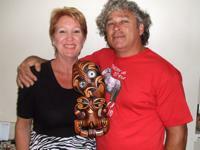 Friends Karen & Laurie with their Tiki from Ohinemutu Maori Handcrafts. They are so proud of it. They are magnificent and although I probably shouldn't say it, it would be well worth taking a visit to the hospital just to see them. 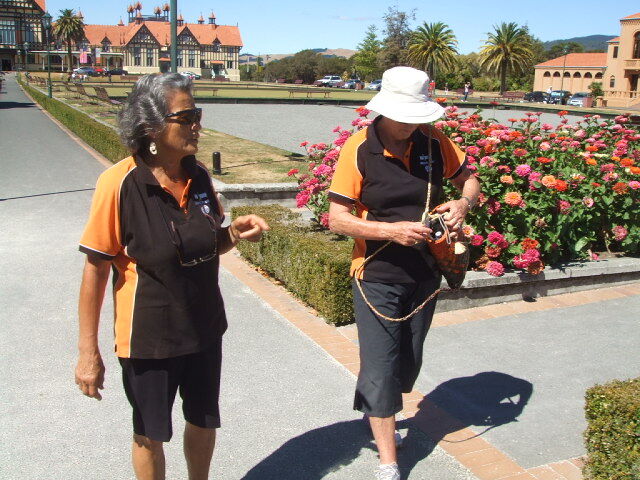 Just imagine if that became a 'Must Do' for Rotorua. Somehow I don't think the hospital would appreciate that. If you are travelling by car, getting to Ohinemutu is easy, just follow the google map directions. The map can also be used for walking directions. It is a flat easy walk that would take about 5mins from the Lakefront. In this view I have set it to leave from the iSite information building in the city which is not too far from the lake anyway. If you are making your way via the Lakefront there is a cafe on the Lakefront as well as a couple of little kiosks by the children's playground. Public toilets are available. If you stand facing St Faiths Church you will see an open shelter kind of building to your left and there are toilets in that. If you are entering the village from the Lakefront by car, drive along Mataiwhera St. You will come to a gate and on your right there will be a building and sign saying Māori Handcrafts, just turn down the driveway there and it will take you to a little carpark area just outside the shop which faces the lake.